We understand that many hospitals are relying on Gabe’s Chemo Duck Program to provide Chemo Ducks to the children at their hospital. While we do our very best to provide as many Chemo Ducks as possible at no cost, it is impossible to keep up with the demand. We are committed to providing huggable hope to children living with cancer. 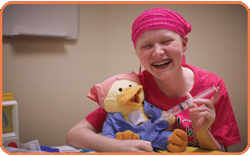 By working together, we can ensure that every child you care for receives their very own Chemo Duck companion and has some comfort during what can be a very challenging time for families. We look forward to strengthening our relationship with you and to finding creative ways to grow your program and connect you with potential donors. This entry was posted in Newsletter and tagged Chemo Duck, Chemo Duck passport, chemoduck. Bookmark the permalink.